The City Auditor's Office on Thursday released an audit on Bike KC, the city's on-street master bike plan. The audit focused on whether Bike KC provides adequate guidance to meet the city’s bike-related goals. The audit concluded that the Bike KC plan is not adequate to guide city staff to meet the city’s multi-modal transportation goal or to become a platinum-level, bike-friendly city by 2020. Bike KC lacks most of the recommended elements of a bicycle master plan. It does not include goals and objectives, benchmarks, policies, design guidelines, recommendations for the types of bicycle facilities to include on road segments, or an implementation plan. The audit also concluded that the Bicycle and Pedestrian Advisory Committee’s (BPAC'S) recommendations have not been adequately incorporated in the development of an update to the Bike KC plan. Although BPAC recommended that updates to Bike KC include recommended elements of a master bicycle plan, the proposed update does not include the elements and is not adequate to achieve city goals. The audit also concluded that 53 percent of the city’s identified bike routes in the Bike KC plan are not suitable for the average bicyclist. About 90 percent of Bike KC's built routes do not include a separate, dedicated space for bicyclists. In addition, the city is not efficiently expanding the city’s bicycle infrastructure and federally funded projects have faced delays and increased costs. The audit includes recommendations to improve the plan’s guidance to staff to better meet the city’s biking goals and improve public input. The city manager agreed with the recommendations. Will the Auditor's Report Lead to Needed Changes in BikeKC? This is a major development in the decades' long work to build Kansas City into a bicycle-friendly city, and to reach the city's stated goal of Platinum-level Bicycle Friendly Community by 2020. It sounds as though there are major shake-ups in store of the city's approach to its bicycle plan--stay tuned. The audit recommends starting over with a new comprehensive bike master plan. Not only was the original plan inadequate, the field of bike planning has advanced tremendously since 2001. Modern bike plans are comprehensive documents encompassing engineering, GIS, design, public policy, community engagement, and performance measures to track tangible progress. Kansas City’s plan lacks most of those. The Kansas City Star followed up with a summary of the auditor's report--which it characterizes as "scathing in its criticism of the city government’s 14-year-old Bike KC plan and its implementation". 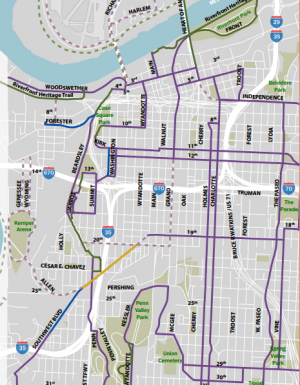 How BikeKC went from "major advance" to "needs major upgrades"
MoBikeFed was deeply involved in the passage of the original BikeKC plan in the early 2000s. That plan was a major advance for the city at the time--when it didn't even have "lines on a map" and passage of anything more detailed or comprehensive was politically impossible. But 15 years later, a much more detailed and comprehensive city bicycle plan is both expected and needed for a city of the size and prominence of Kansas City. Other similar cities around Missouri, around the midwest, and around the country have been creating and implementing their detailed, comprehensive, specific citywide bicycle plans that include timelines, implementation plans, and budget. Meanwhile, Kansas City has made significant progress from the "no bicycle plan at all" status it held at the turn of the century. But despite that progress, peer cities across the country started out ahead and have moved forward faster as well. The result is that Kansas City is lagging far behind its peer cities. Changes are needed, and the auditor's report creates an important opportunity to make them. This isn't just opinion--data from the U.S. Census annual reports on bicycle commuting clearly show that Kansas City is lagging behind other cities in Missouri. The 2015 Census data for Missouri pegs bicycle commuter mode share percentages of St. Louis, Columbia, and Springfield at five to seven times the bicycling rate in Kansas City. This data reflects a significant and important difference in bicycle friendliness and bicycle acommodation among our major Missouri cities--and Kansas City comes out very much at the bottom of the barrel. In short, the auditor's conclusion are right on the mark. We are look forward to seeing the positive new direction Kansas City will take in response to this audit. Congratulations and thanks to the city staff, citizens, and local advocates who have worked hard to help the city reach this point. 2008: Bike KC initiative "actually underway"
2008: BBC on KC: What it's like to bicycle in one of the least bicycle friendly cities the U.S. 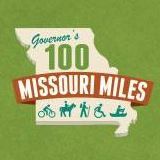 Working for creation and implementation of comprehensive, effective city, region-wide, and state bicycle and pedestrian plans across Missouri is one of the goals of MoBikeFed's Vision for Bicycling and Walking in Missouri. These plans are essential to achieve our goal of building a world-class bicycle, pedestrian, and trails network across Missouri--and in every city in the state. We work to support the efforts of local groups to create and implement local plans, and build a statewide movement of support for region-wide and statewide plans. Your ongoing membership and generous financial support helps turn our Vision into reality. « Previous story: Rock Island Trail Update: Connections for Springfield, St Louis? And more from MoRIT . . .